The London Marathon celebrated its 34th running in style—with two world-best times and one course record. Wilson Kipsang of Kenya, already the fastest man in the world, won the men’s race in 2 hours, 4 minutes, and 29 seconds, setting the world’s-best mark this year and improving the course record. In the women’s race, Kenya’s Edna Kiplagat, the two-time marathon world champion, triumphed in 2:20:21—also the fastest time of the year. 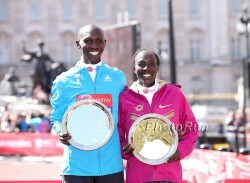 For Wilson, it was his second victory at the Virgin Money London Marathon, adding to his 2012 win. He finished ahead of his compatriot, Stanley Biwott (2:04:55) and for the first time ever in London two runners went under the 2:05 mark. Third place went to last year’s winner, Tsegaye Kebede (Ethiopia/2:06:30). Edna Kiplagat finished the race only three seconds ahead of Florence Kiplagat, Kenya’s world-record holder in the half-marathon. Florence, who is not related to Edna, crossed the finish line in 2:20:24. Third was debutant Tirunesh Dibaba (Ethiopia) in a strong 2:20:35. Only two women have been faster in their debuts than Tirunesh: Paula Radcliffe (GB) in 2:18:56, and the Kenyan runner, Lucy Kabuu in 2:19:34. In another closely-watched debut, Mo Farah, the British two-time Olympic medalist, finished eighth in 2:08:21. The race was run through London in great weather, with about 36,000 athletes participating. Yet another highlight was the appearance of Ethiopian superstar Haile Gebrselassie as pace maker in the men’s race. The first runner to break the 2:04 barrier (2:03:59 in Berlin 2008), Haile was supposed to maintain a world-record pace until 30K or at least over the half-marathon distance. But with 29:11 after 10K and 44:06 after 15K, he could not hold the intended pace any longer and dropped out of the race. The Kenyan Richard Sigei was the second pace maker, but the speed slowed down in subsequent kilometers. The leaders reached the half-marathon point in 62:30, 45 seconds slower than initially planned. At that time, eight runners made up the lead pack behind Richard Sigei who set the pace up to the 25K mark (1:13:58). At 30K, the course-record holder, Emmanuel Mutai (Kenya), who won the race in 2011 in 2:04:40, began to struggle. Shortly thereafter, Wilson Kipsang took the initiative and went into the lead. Surprisingly, only Stanley Biwott, the winner of the 2012 Paris marathon in 2:05:12, was able to follow the world-record holder. Last year’s winner, Tsegaye Kebede (Ethiopia), also fell back as did Geoffrey Mutai (Kenya), who ran the fastest “unofficial” marathon ever (2:03:02) in 2011 in Boston on a course that does not confirm to record requirements. The winner of the Dubai Marathon, Tsegaye Mekonnen (Ethiopia), also could not stay with the leaders. The exciting duel between Wilson Kipsang and Stanley Biwott endured until 40K. Then, in spite of the already-strong pace—both ran the 5K between 35K and 40K in 14:38—Wilson surged once again and was first to cross the finish line. Mo Farah placed himself in the chase pack from the beginning. With 63:08 minutes at the half way mark, he was 12th and well on course for the British record (2:07:13) and European best (2:06:36). But after 30K, he could not maintain the pace. “I just had a bad day at the office,” Mo said after the race. 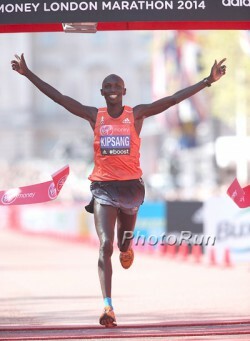 Wilson Kipsang acknowledged that he had had a great day. “I feel I performed very well here,” he said. “There were a lot of strong guys and it was a tactical race. My plan worked very well.” Then he revealed that he nearly missed racing on Sunday. When he came to leave Kenya last week, he found that his car had been broken into and that his passport and visa had been stolen. Thanks to the help of the event managers in London he managed to get replacement documents in time to make his flight. “It’s really great to win the London Marathon again, and I hope to do it again very soon,” he said. In the women’s race, the returning champion and favorite Priscah Jeptoo (Kenya) had aimed to go well under 2:20 hours, and at the half-marathon mark, reached in 69:15, she and five others were at the front. After 25K there were four runners vying for the win: Edna and Florence Kiplagat as well as Tirunesh Dibaba and Priscah Jeptoo. But suddenly and unexpectedly Priscah dropped out. It was on the final stretch, close to Buckingham Palace, that the duel between Edna and Florence Kiplagat was decided. “Over 40K I tried to push Florence around, but she came with me every time,” said Edna, who had the better sprint in the last 200 meters and finished three seconds ahead of her rival in front of a cheering crowd. For the 34-year-old, who is the first woman to win the marathon world championship twice in a row, her triumph had been eagerly awaited. In the past three years she placed third, and second twice in London. This year, she was finally the winner. The London Marathon has one of the strongest elite fields in the world. It is also one of the best marathons for charity running. Even before Sunday’s race, participants had raised about $1.1 billion for non-profit causes since the event first started. Last year, a record $89 million was donated, and this year’s figures are expected to be similar. That makes the London Marathon the largest charity event on a single day in the world. The donations not only come from the participants who collect money for various non-profit purposes, but also from the race’s organizer. Since 1981, the structure of the London Marathon enterprise has been set up in such a way that the foundation distributes the yearly profits to non-profit initiatives. A big part goes to projects in London—like the building of playgrounds or sport fields. A new organization that is supported this year is called SPAT, an initiative that helps young homeless people in the British metropolis by empowering them through running. Notable among the charity runners was 86-year-old Iva Barr, the oldest female participant, who has been taking part in marathon races since 1982. This year marked the second time that she ran for WhizzKidz, an organization that helps disabled children. We congratulate Iva on her remarkable finish time of 6:58:59 at her 15th London marathon! In his marathon debut, 31-year-old Kenenisa Bekele (Ethiopia) ran a world-class time of 2:05:04 and improved the course record by eight seconds. The old record of 2:05:12 was set by Kenya’s Stanley Biwott two years ago. Kenenisa, a three-time Olympic champion who still owns the world record over 5,000m and 10,000m, achieved the sixth-fastest debut of all times, if the time of Moses Mosop (Kenya/2:03:06) on the Boston course that does not confirm to record requirements is not included. The unofficial debut world record belongs to Dennis Kimetto (Kenya) with 2:04:16 in Berlin in 2012. 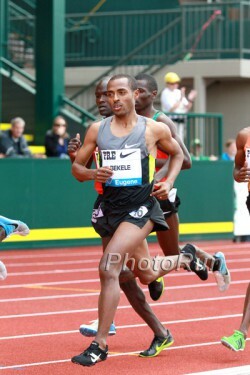 “It was a difficult race,” said Kenenisa Bekele, who finished ahead of his compatriot Terfa Getachew ( 2:06:49). Third place went to the Kenyan Luka Kanda who clocked 2:08:01. Both also set their personal bests in the race. The women’s race was a clear victory for Flomena Cheyech. The Kenyan runner won in 2:22:44 and also set a personal best. Second was Ethiopia’s Yebrgual Melese in 2:26:21 ahead of her compatriot Ahmed Zemzem (2:29:35). Nearly 50,000 runners participated in the Paris Marathon.